An Indian cyclist who is on a mission to peddle around the globe has reached Qatar after touring 79 countries. Somen Debnath, who plans to set up a global village near Kolkata in West Bengal, has already toured 79 countries and plans to visit 191 nations by 2020 and he will move to Saudi Arabia on August 15. 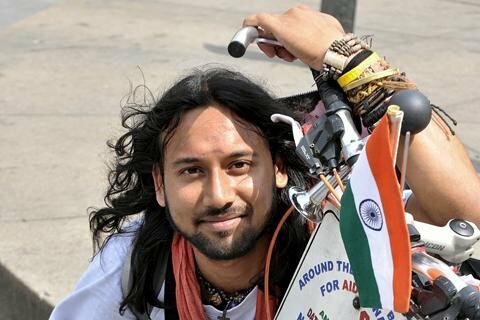 Debnath started his ‘Around the World on Bicycle’ initiative in 2004 to spread awareness on HIV/AIDS. Debnath said he expects the local government to award him eight hectares of land for his global village. He plans to cover 200,000 kilometres, reaching up to 2 million people by the end of his journey in 2020. About his plans for a global village, the idea is to share and care for everyone in society irrespective of their caste, color or creed and give dignity to each of them. The young adventurist also claimed that all his expenses were covered by people he met during his journey.